I love the feeling of being in the forest with great old trees. While we were painting, a walker came and sat with a dog. He picked up a stick and threw to get the dog playing. But the dog refused. Dogs were not allowed in the woods. The dog owner called the dog to come to him. The dog did not come. It went to the edge of the woods and started calling! The dog loves the woods so much that it calls out loud “ Woof! Woof!... I want to go into the woods!”. I think that’s what I heard. Among mature NZ natives of Dingle Dell is a beautiful cabbage tree. 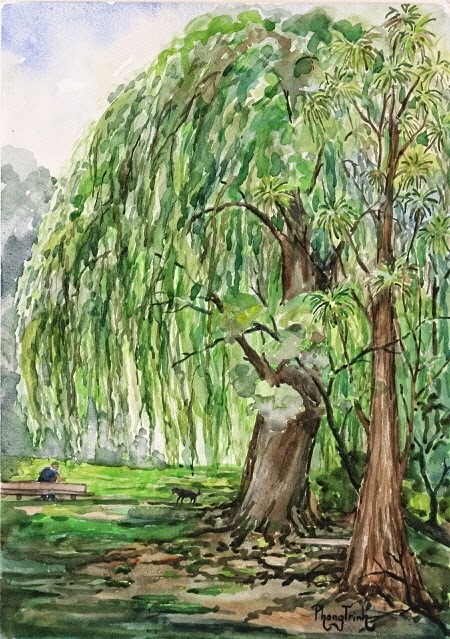 The green leave curtains of willow trees give great light effect. It's another enjoyable en plein air experience!